Two good blogs that I know of are covering the Gulf oil spill from a bird-centric, ecological perspective, and you may be interested in them. The first is the Perch, from Audubon magazine. This one focuses on the wildlife affected by the spill and the wildlife clean-up efforts now underway. The second is from the American Birding Association and is called simply Gulf Coast Oil Spill. Most of the time I stick pretty close to my own cabin, perched on this island of forest above the populated valleys below me. One of the reasons I blog is simply because I want to record what’s here in an eastern forests in the early part of the 21st Century. I want others to see how it’s possible to live amongst the natural world and still be a part of, if sometimes a reluctant part, the modern world. I want to show that you don’t have to be a hermit in the Alaskan wilderness to live a life that’s compatible with nature. You don’t have to be scientist or a researcher or a writer for National Geographic either. Anyone can do it. I’m anyone. And it’s time for me to say how shocked I am at the devastation down in the Gulf of Mexico. I’m shocked that the oil spill could happen. I’m more shocked that it’s taking more than a month to stop the flow of oil. I’ve been upset by statements from everyone from the press to the president who all seem to equate the spill more with lost revenue than with ecological damage. But I think I’m most shocked by the relative apathy about what the oil spill will mean to our earth. I know more about birds than fish and oceans, so I will talk more about those. I can tell you that perhaps as many as 12 species are endangered by this spill, possibly to the point of extinction. Mottled duck appears to be one of the most vulnerable. They are a lot like a black duck and are local to the Gulf Coast. Two other waterfowl species that are also especially vulnerable are Redheaded ducks and Greater scaup, both of which winter exclusively along the Gulf Coast. 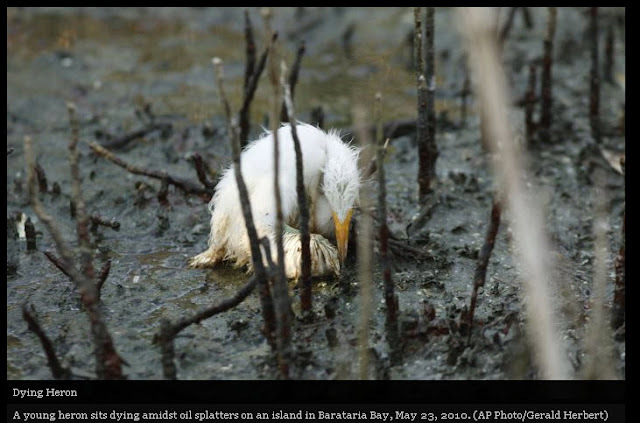 The devastation to shorebirds and seabirds is as yet incalculable. This is the breeding season, and if there’s a worse time for something like this to happen, I don’t know when it would be. Everything on our planet is interconnected. The fish feed the birds, the fish feed on smaller marine life, the smaller marine life depend on healthy waters. Pundits claim that all politics is local. I’d like to turn that around and say when it comes to the environment, nothing is just local. The volcano in Iceland shuts down air traffic throughout Europe. The Gulf oil spill may well result in extinction for some species, devastation of the waters throughout the south and possibly beyond for years to come. The hurricane season may well be worsened by the spill itself. Worries are that those storms could carry oil inland as oil-contaminated raindrops, where they could fall on farmland and damage that. We can’t afford to be ignorant of our planet anymore, not when we have the power to destroy it and I don’t mean just with nuclear weapons. An oil spill can destroy our world just as easily, if not as fast. We can’t afford to feel no connection to nature, because it’s nature that sustains all our lives. It is time, past time, to put nature in the forefront of our education and our decision-making. Our lives depend on it. Our kids’ lives depend on it. PBS Newshour’s Web site has posted a series of photos, of which today’s is one, that documents some of the destruction to wetlands and wildlife. The photos are terrible to look at, but we have to look. Summer is a lot noisier than winter. I was reminded of that last evening as I sat out on the steps. Bees buzz, dozens of birds call or sing. The slightest breeze rustles millions of leaves. 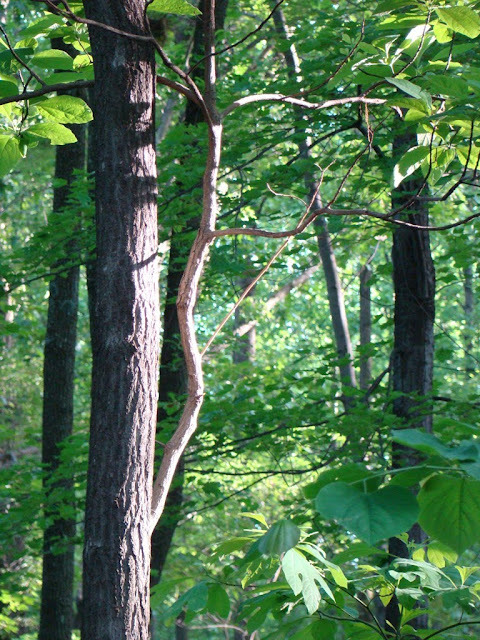 Forest sounds are a constant backdrop in the summer. Winter by comparison is often silent. A few birds remain but unless I disturb a blue jay or a crow, they tend to keep to themselves. The trees are nearly silent, too. It takes a fair wind for the trees themselves to creak. The leaves are long gone by then, of course. It’s hard to imagine a noisy winter or a silent summer. I can’t make the switch, even when I try. And last night was noisier than most. One of the red fox was back, barking and close enough to my chicken pen to start them off making as much noise as they could, and that started the dogs howling like wolves. Soon the blue jays joined in. Eventually I had to go over by the chickens and look large and threatening so the fox would leave the area and the chickens would calm down. Summer is a lot noisier than winter. Since the sky is clear again, I can get out and enjoy the morning light as the sun's first rays clear the hills to the east. The light seems novel after weeks of rain and overcast. This year April didn't have showers but May is sure making up for that. The forest around my cabin dried out a bit yesterday and will dry even more today. I’m enjoying not getting soaked feet or hearing a squishing sound when I take a walk. Sometimes it’s the littlest things that make me the happiest. It’s not just me that feels happier when I can comfortably get out and about. Even the chickens seem happier. They were thrilled last evening just to take a dust bath in the dirt. Everything from groundhogs to rabbits to white-tailed deer were out last evening, too. So I’m pretty sure it’s not just me that’s happy to see the rain end for a while. Last evening, the twilight lasted until late, the sky holding some level of paleness long after the time I was used to because the cloud cover was gone. This time of year, going a week or two without seeing a clear sky makes a big difference in how long the twilight lasts. When the sky finally does clear, it’s as though the evenings are an hour longer. I know that’s not true, but it feels that way. The sunshine this morning was most welcome too, even if the light outside my bedroom window at 5 a.m. looked the same as the light at 5:30 a.m. on a cloudy day. I can get used to that. It was never a hard rain, but days of unrelenting mist and drizzle are just as wearing on the spirit. Today my view everywhere I look is green and greener. The temperature will rise from warm to hot by tomorrow. I believe I am ready for that. I had heat on at the cabin until the morning of May 20. That’s the latest ever, I think. I might have been able to do without earlier if the weather hadn’t been so damp. 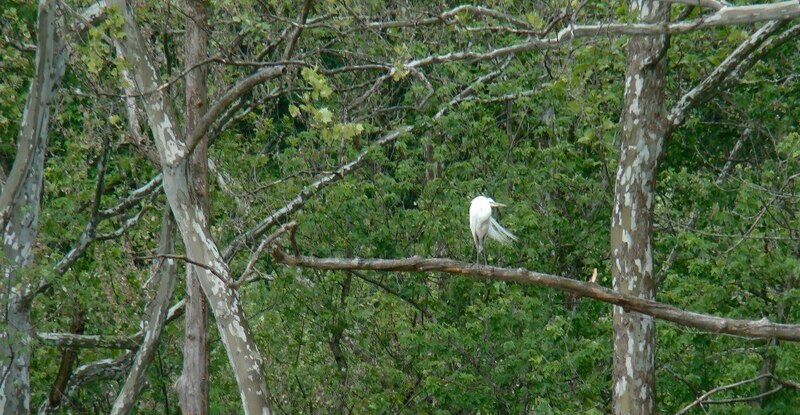 The weather may have been a factor in two unusual bird sightings over the weekend. The birds themselves weren’t unusual, but I never saw an eastern towhee or a red-winged blackbird in a tube feeder before. They don’t quite make up for the lack of warblers on the mountain, but they were still a pleasant surprise. I am looking forward to taking a hike without getting soaked feet. Walking shoes take forever to dry out when the weather stays wet. By using an old pair, I managed to walk three days in a row before I ran out of shoes. Then I decided to wait to walk again until the first pair was thoroughly dry. Today, if you'll permit me, will be a small lesson in telling a native wild rose from the invasive multiflora rose. 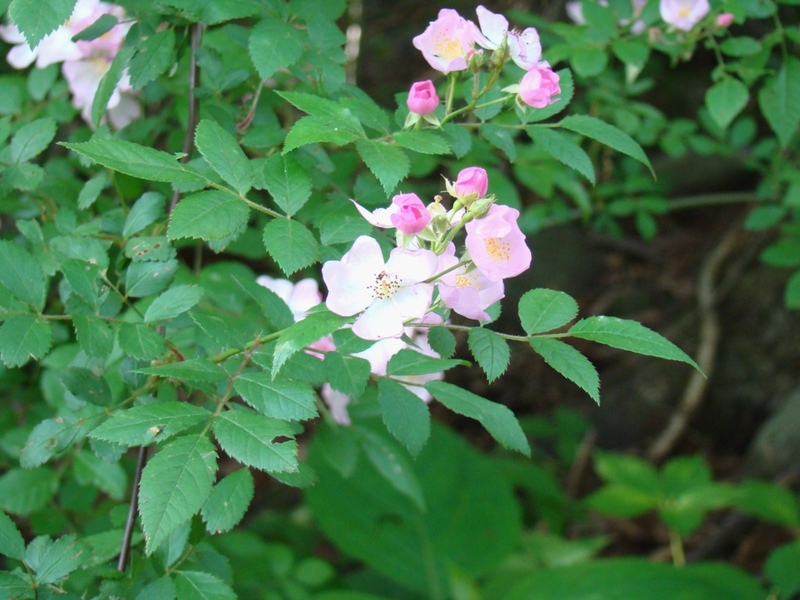 The photo above is a native wild rose, the Carolina rose (aka pasture rose). This is the only plant of it I've seen at Roundtop. It grows along the lane up to the cabin. It's a lovely shade of medium pink, with dark green leaves. The rosebuds are especially pink. Almost directly across the lane from it is one of many multiflora rose plants that have sprung up around the mountain. Were it not an invasive, introduced species that pushes out native growth, I would likely report this was also a pretty plant, if not as stunning as the Carolina rose. 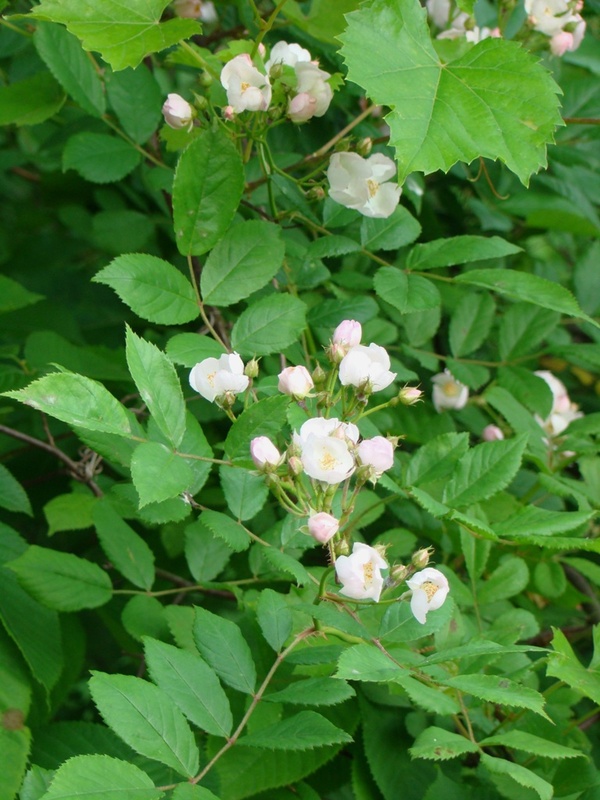 The multiflora rose is paler than the native rose, and in some plants a pink shade to the flowers is barely visible. In many plants the flowers appear white. The leaves are a slightly paler shade of green than the Carolina rose sports, but you really have to see the leaves side by side to notice that. Another difference is that the multiflora rose produces flowers that are less clumped than the Carolina rose. Multflora flowers are spread out along the flower stems, while the Carolina's flowers grow in distinct clumps of buds. The differences between the two seem slight and may be difficult to discern unless you can look at both plants at once, as I am able to. I wish I didn't have that opportunity. I can report that despite their proximity, the Carolina rose plant is large and healthy, larger than it was last year. I hope it stays that way. Yesterday was the day the babies of the mountain were out in force. First, I saw these 7 Canada goslings, whose mother eyed me very suspiciously. I don't know where dad was. He's usually right there too. Even a few of the babies are starting to develop that same suspicous look. The second baby I found was the tiny killdeer. Baby killdeer look so much like their parents that unless they are standing next to the parents, it's not always easy to see how small they are. in this case, junior circled my car while mom screamed plaintively from the sidelines, trying to lure me away from baby. Baby seemed a lot less worried than mom. Perhaps baby was testing his independence just a bit. I am posting this photo today for no good reason except it’s the only one I’ve taken recently that has a bit of blue sky in it. My other recent photos are green, all green, and today I’m tired of green. Also, it’s raining at the cabin again, and I didn’t feel like posting a rainy photo either. It’s a scary thing to think I’m already feeling a bit bored with green and it’s not even Memorial Day yet. Hopefully, this is just a momentary bit of ennui, and the real boredom with green won’t set in before August at the earliest. The first tornado warning of 2010 sent Baby Dog, Dog and me to the basement on Friday evening. Fortunately, nothing happened at my cabin or elsewhere. The tornado cloud stayed in the sky and apparently didn’t touch down, but the sky turned so black that I couldn’t even see out my tiny basement window for a few minutes. Hail soon followed for a few seconds, followed by some not-awfully close thunder and lightning and then the excitement was over. I saw the tornado-ish looking cloud as I was driving home from work Friday evening. It looked like a huge, black jellyroll in the sky. Those are never good things. The nasty weather reminded me that the time of year for such activity has arrived here on the mountain. Fortunately, I don’t see many tornados, but the summer thunderstorms can bring enough destruction and concern. 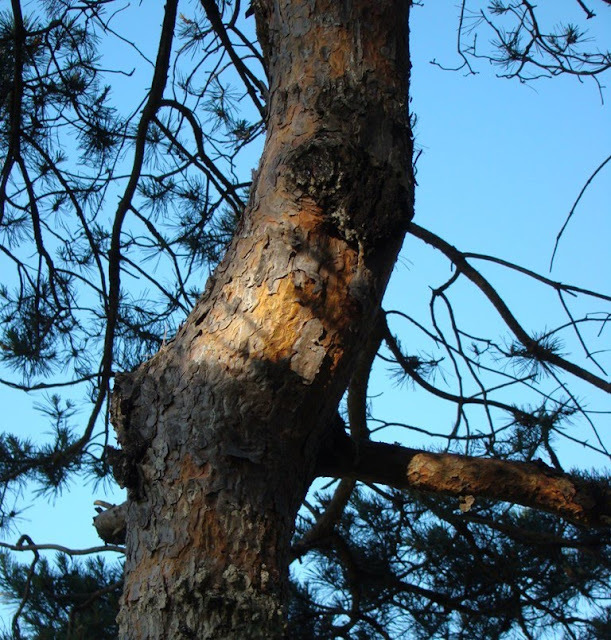 Wind damage and the possibility of falling trees are always a threat. The possibility is always there but fortunately isn’t frequently realized. More common are the weird things that lightning can do. My neighbor’s well pump got knocked out by it a few years ago. It’s also not uncommon for lightning to hit a nearby tree or a transformer. Electricity gets knocked out here fairly regularly, though it’s not all that common that it stays out for longer than 8-12 hours. This time of year, losing electricity for half a day is an annoyance but not a real hardship. In winter, that becomes a different story, mostly because of the possibility of the water pipes freezing. Once I lost electricity for just a few hours shy of a week—that wasn’t fun either. The power line that supplies Roundtop and my cabin runs through the woods for about a mile, perhaps a bit more, before it reaches us. All it takes is one tree falling on it for the electricity to go out. And often the utility company waits until the storm passes or for daylight the next day to begin their search for which tree is causing the outage. Sometimes, they take so long to show up that my neighbor has taken to riding the power line himself to find the tree and report where it has fallen to try and speed things up. Now that I have the chickens to worry about, in addition to the rest of the critters, I’m thinking I need to keep more water stored and on hand. No electricity means no well pump, too. The woods around Roundtop have been oddly quiet this week, as have I. For the second week in May, the dawn chorus is lackluster to say the least. I have the usual range of ovenbirds and wood thrush, the pewees and cardinals, an oriole or two. But those danged warblers have been virtually nonexistent. One exception is the yellow-rumped warbler—I’ve heard a couple of those, not many. For the rest, nada. I did think I heard a red-eyed vireo for a bit, but it was distant, with background sounds interfering and by the time it was quiet enough to hear the bird, the singing had stopped. I suppose I could blame the lack of migrants on the odd spring weather, and that may well be the case. But I must confess that I’m suspicious that is not the answer or at least not the full answer. Too many others—from birders to nature centers to bloggers—are reporting the same thing for me to be satisfied with the spring weather answer. I’ve also heard many reports about reduced numbers of dragonflies and moths, as well as the birds. I have yet to see a dragonfly this year, though I think I’m at least fairly well-stocked with moths, if the ones that gather by my porch light are any indication. Still, the apparent low number of avian migrants is something that nags at me and likely will for some time. The forest was especially quiet this morning when Dog and I started our early morning walk. The sunrise was just getting organized, but already showed signs of bad weather ahead. It wasn’t the “red sky” of sailors’ legend, but it was orange and mauve and leaning in the red direction. Perhaps that foretells a puny little storm or a maybe bad storm that won’t hit for a while longer. The wind was calm, and as the birds woke up and started to sing, the sounds carried for what seemed to me like longer distances than is typical. The pewee’s haunting song is one that winds throughout the forest on any day, and this morning’s moist air carried the notes even further. Who would think that such a tiny little bird could make a sound like that? Perhaps it’s the pitch or the notes, but there’s something about the song that surrounds the air with its song. The cardinal’s song doesn’t carry the way the pewee’s does. The wood thrush song comes close, but I still think the pewee wins that contest. Perhaps it’s the way the pewee holds the notes, when many other birds clip off their notes. I have no answer. I do know that to me the pewee’s song is every bit as haunting and as lovely as a loon’s. Their song conveys that same eerie mystery of the wild, only their song speaks of the Appalachian forests, if not the northern woods of the loon. Dog pays no attention, of course. To him the walk reveals nothing of interest—no rabbits, no fox, no squirrels—to capture his attention. He plods beside me, head down, bored. My photo today was taken a mile or so from the mountain. I felt the need to see a vista the other day. The trees are hiding all the ones at the cabin until fall. The second week of May in this area is the primest of the year’s prime times for birding. It’s the time of year when warblers and songbirds move north. 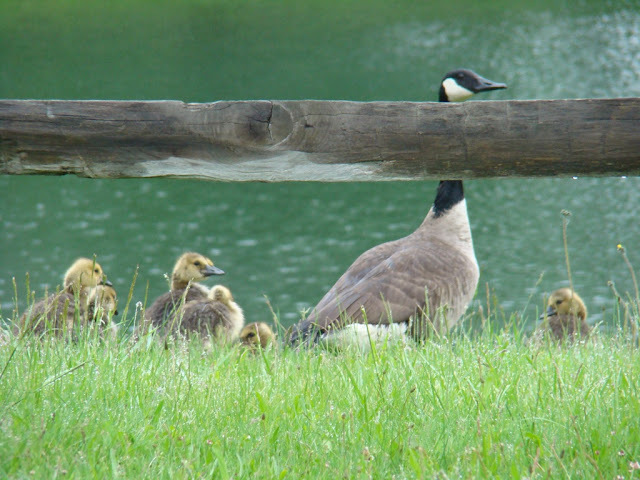 The summer residents appear and settle in. So if there’s any one time that I want to get out and bird, it’s now. So I did. I didn’t do anything exotic. I just made a run down to Brunner Island along the Susquehanna River to see what was going on there. Truthfully, I wasn’t expecting all that much because near-gale force winds rocked the mountain on Saturday and weren’t ready to fully dissipate by Sunday. But I was pleasantly surprised, if not overwhelmed, by the new species I found for the current year. As much as I think of my Roundtop bird list as my “real” list, it’s fun to occasionally do a little birding off the mountain. 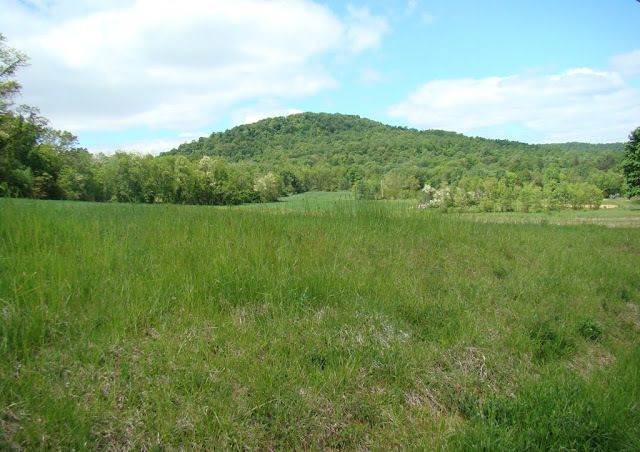 Brunner Island is along the Susquehanna River, so the habitat there is a lot different than on Roundtop, though it’s still in the same county. Here, shorebirds and gulls are common, unlike up on the mountain. And even warblers are generally more common, though some years I’ve had some wicked good waves of them at the cabin. 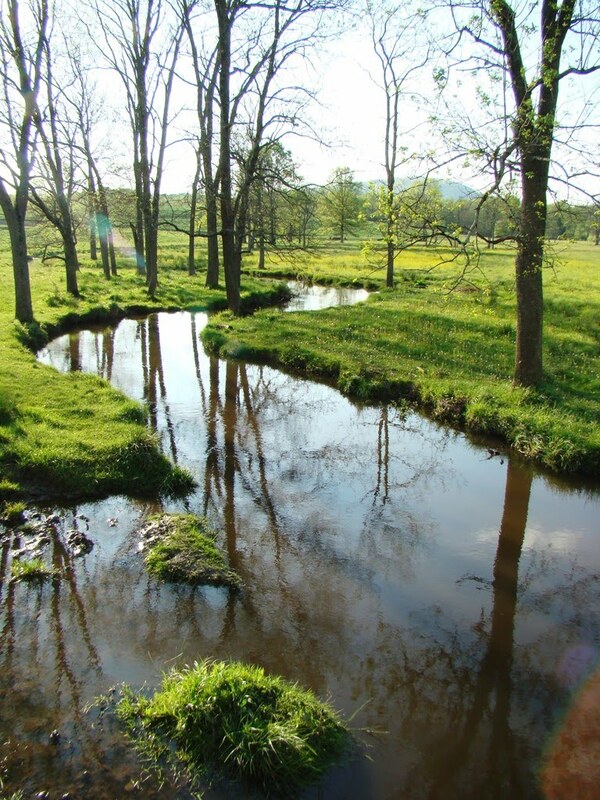 Roundtop doesn’t have a swamp or a river, but Brunner Island has both. I saw a pair of orchard orioles in the swamp meadow area, and Canada warblers, blue-gray gnatcatchers, cedar waxwings, indigo buntings, a green heron, among others on my one-hour trip. 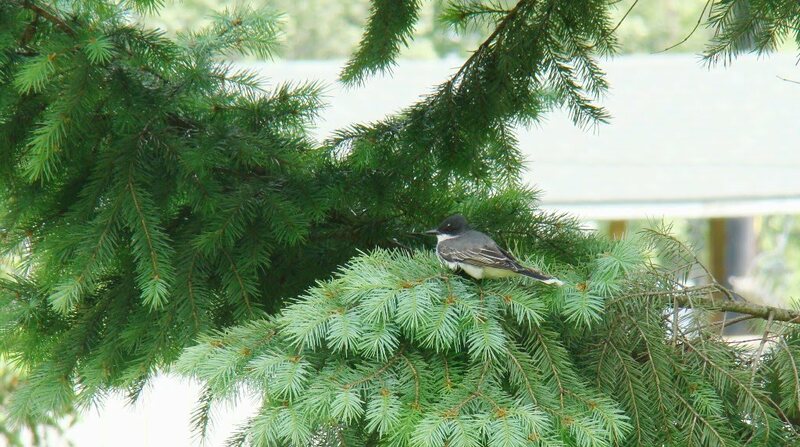 Back up on the mountain, I heard the first eastern pewee this morning, so the full roster of summer residents have now arrived. The little pewee probably wasn’t expecting to arrive to frost, but I had a little of that this morning too. I kind of hope that’s the last of that until October. A few evenings ago Dog and I wandered on a wooded trail down the mountain. The trail we followed stays wet longer after a rain than elsewhere, and I wanted to see if it was dry enough for a walk. 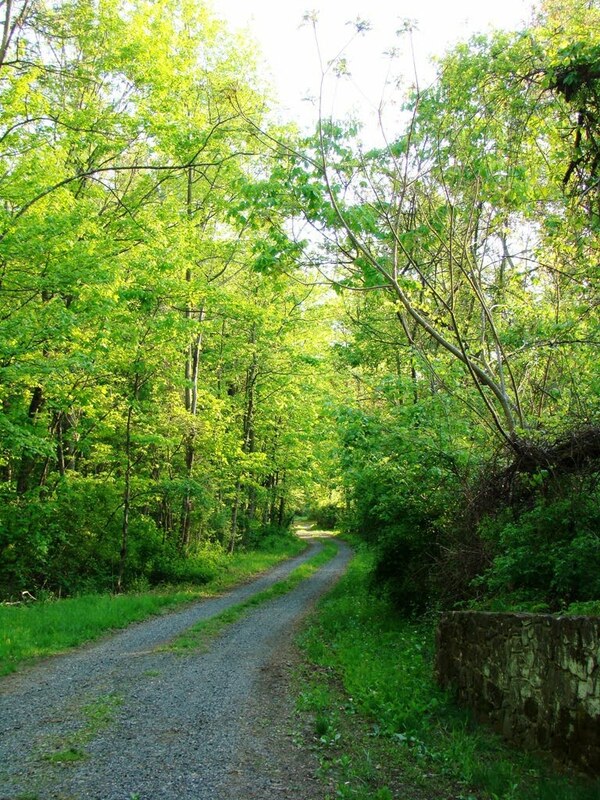 This trail is one of the ones I use when I take kids from Roundtop’s Adventure Camp to explore the woods. Because the path had been so wet, I hadn’t been on this trail since the spring growth was well up, and now I wanted to see the changes. Dog needed a decent walk, too, though taking both Dog and a camera is not always smart. Whenever I stop to photograph something, Dog tries to shove his way in front of me, sure that I’m looking at something to eat. Keeping him from stepping on the something I want to look at usually means I can’t use the camera with him around. The path down the mountain is hilly but not rocky, with dense undergrowth and a lot of ferns. Last year, for the first time ever, I found a maidenhair fern right off the edge of the trail. I wanted to see if that particular fern was growing again this year, and the two of us headed down the hill to look for it. I wasn’t sure I’d remember exactly where to look, as finding something that’s less than a foot across and the same color as everything else in the woods isn’t always easy, especially without any major landmarks near. 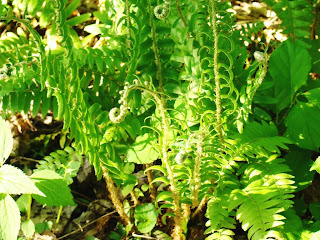 The other ferns are starting to grow along this section as well, though many are still unfurling. The area boasts several species of ferns—long beech, Christmas, sensitive, oak, lady among them. Ferns are notoriously difficult to identify because there are so many of them and because the differences between the species are often only discernable by looking at the spores. I do the best I can with a few field guides. I thoroughly enjoy finding a different one on my walks, and if I can’t identify it closer than its family, well, that’s just the way it is. 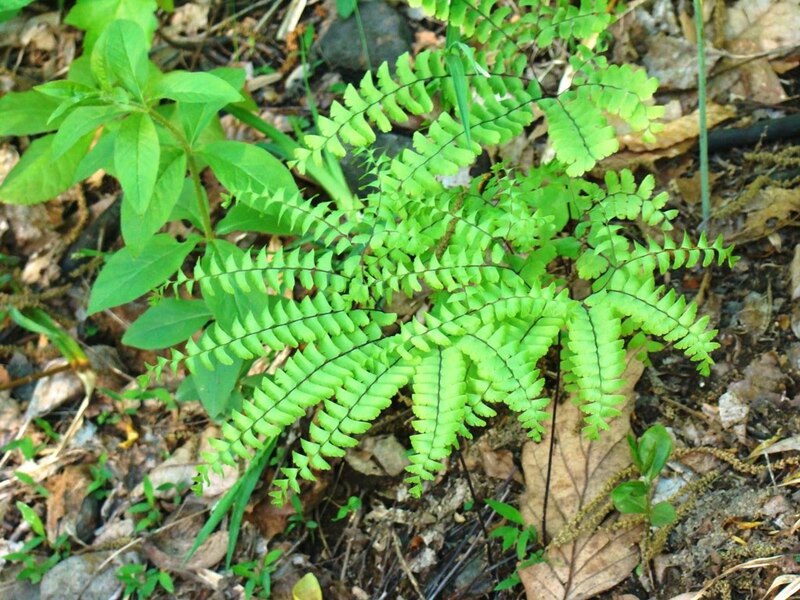 So when I find one that I can identify, like the northern maidenhair fern, as well as one that doesn’t have 1000 more plants just like it in the woods, it really makes my day. This very cool hawk moth spent a little time by the door of my cabin last night. All hawk moths are cool, in my opinion, and this one was no exception. So what kind of hawk moth is it? I’d say the moth is a master of disguise, because I’ve already positively identified it five times and I still can’t tell you what it is. I am, however, starting to have a really long list of what it isn’t. This particular hawk moth is challenging because it is fairly nondescript and doesn’t have patches of pink or lime or yellow on it, as many of them so conveniently do. There’s unfortunately a whole group of hawk or sphinx moths or varying shades of brown and browner. At the moment I’m leaning towards a hawk moth of the manduca genus, possibly manduca sextus, which is also known as the Carolina sphinx, but is well documented in Pennsylvania. 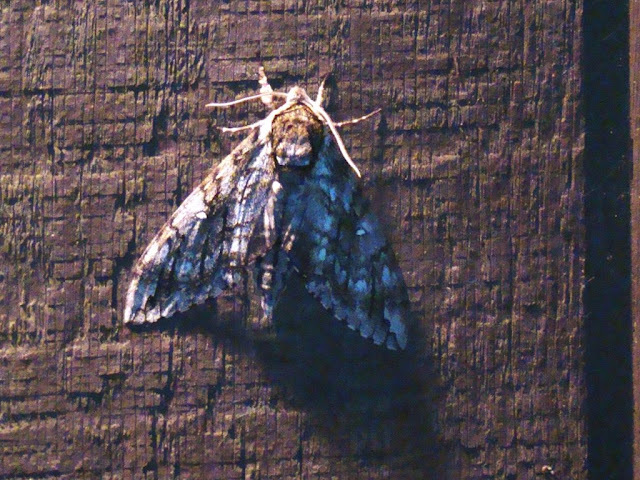 I’m also hampered in my identification by the moth itself. Its wings aren’t spread, and when I very cautiously touched it last night, it didn’t budge, and I didn’t make a second attempt. If I’d been able to see the moth with its wings spread or at least had a decent view of the spots along its abdomen, identifying it would be much easier. Let that be a lesson—look for the abdomen spots and try to see those wings spread if you want to identify one of the well-camoflauged hawk moths. I can tell you that this moth was a lovely, large one whose wingspan would easily have been 4 inches if its wings were spread and whose body length was a good 2 inches. 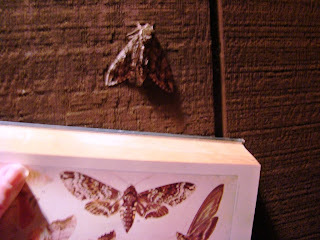 I used books and online resources in my attempt to identify the moth. My favorite book is the 1904 The Moth Book by J.M. Holland. A good moth and butterfly site is http://www.butterfliesandmoths.org/, which allows you to look for species by your state and county records and has a photo of each. The landscape at Roundtop is as green as the brightest emerald right now. Add a little sunshine and it almost hurts my eyes. So last evening I’m trying to decide if the green really is more intense this spring or if I simply have “forgotten” just how bright springs routinely are. So I gathered up my May photos from 2007-2009 to compare them with 2010. The last two years I’ve been using the exact same camera and the two years before that I was using the same brand of camera I am now. And you know what? This year is greener. For the record (and to be fair), 2009 was pretty green but suffered from many days of rain and overcast skies to handicap those results somewhat. May 2008 had some overcast weather and then went directly to hazy, summer-ish skies, so the quality of light wasn’t the best then. May 2007 seemed to have a lot of foggy days and the greens in those photos were already taking on the deeper green of early summer. 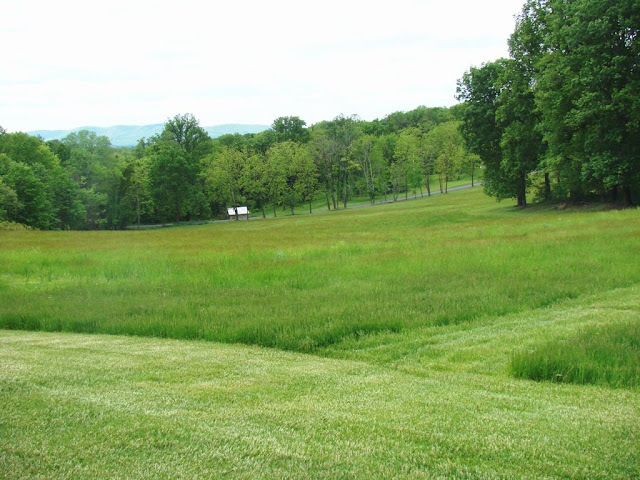 So my conclusion is that yes, May 2010 is both greener and brighter than Mays around Roundtop have been for at least the past several years. And by extension, that means my memory for such things isn’t totally off-base. 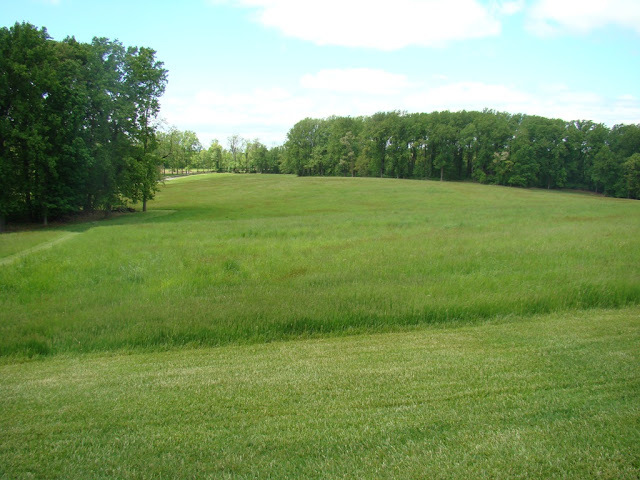 I suspect the heavy snows this past winter contributed nicely to the lush greens I am seeing right now. The bright skies this year are simply the luck of the draw. In any event, I will enjoy it all while it lasts, because if the past three years are any guide, May might not look quite this good for at least another few years. This past weekend I ventured off Roundtop Mtn., and just for something different to do, I traveled down the road bit to Adams County and visited a different mountain for a change. I visited my favorite fairgrounds and the Apple Blossom Festival at South Mountain. 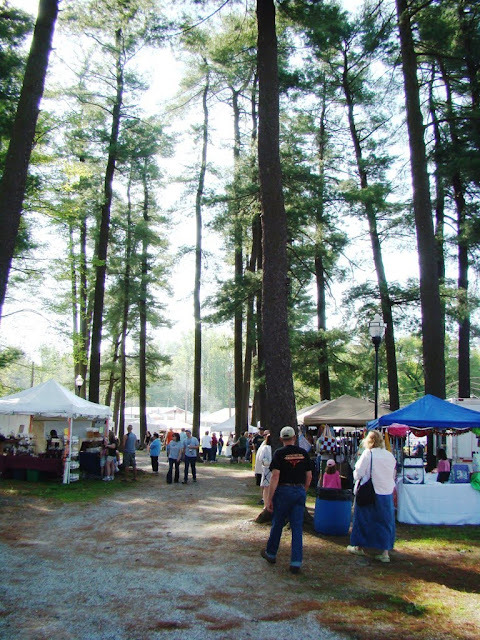 The Apple Blossom festival is the smaller, spring version of the two weekend long, National Apple Harvest Festival that takes place in October. I like the spring version better, simply because it’s smaller and less crowded. In the spring I don’t have to get to this tiny fairgrounds by shuttle bus or brave the traffic caused by people from four states who don’t know where they are going snarling the two-lane roads. In the spring, it’s mostly the local folks who attend. The food is the same—and just as good—and so are the crafts. And when the weather is as lovely as it was on Saturday morning, what’s not to like? I went early and managed to park just a few feet from the craft barn, so I didn’t even have far to walk. 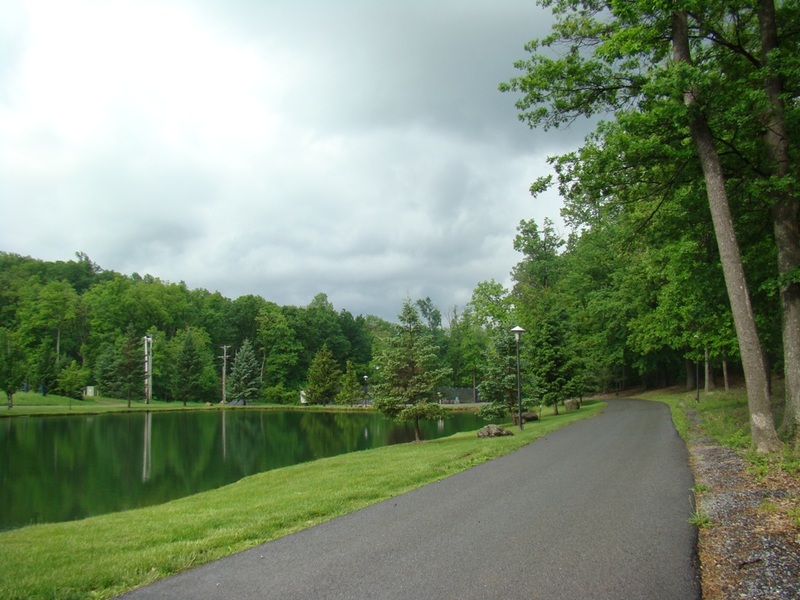 Not many fairgrounds are nestled among tall pines, at the foot of a mountain, with a fine trout stream rushing down the mountain just a few feet away. For ambiance, the place simply can’t be beat. Doesn’t this photo look like early summer? As it’s only (very) early May, the forest should still be looking like spring, not summer, but that warm spell in March really advanced the seasons this year. Right now, everything is lush and bright green and of course, very pretty. Overnight, a downpour drenched the mountain, and thunderstorms danced around the trees. This morning the creeks are swollen and muddy—not very pretty. On Friday evening I heard the first ovenbirds of the spring, followed by the first wood thrush the next morning. That’s the typical pattern here. The wood thrush are always either half a day behind the ovenbirds or perhaps they arrive together but the wood thrush don’t sing until half a day later. The two arrive that way every year. The ovenbirds are always first but only just barely. A few warblers, mostly yellow-rumped warblers, flittered past the cabin this weekend too. 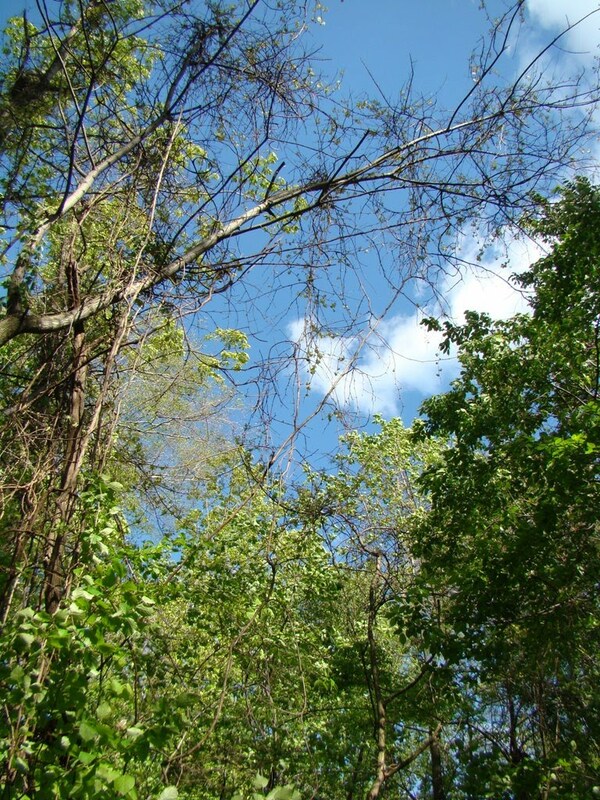 With the trees as well-leafed as they are, spotting and identifying warblers is a particular and unhappy challenge this spring. I can’t always hear warblers anyway—many of their songs are too high-pitched by my ears—but even for the warblers I can hear and identify by sound, I’m not getting much help. The rest of the dawn chorus drowns out many of their songs. The dawn chorus is awake and singing in full voice around the cabin, and the sounds of wood thrush and ovenbirds and cardinals are a lot louder than the soft little twitters made by many of the warblers.